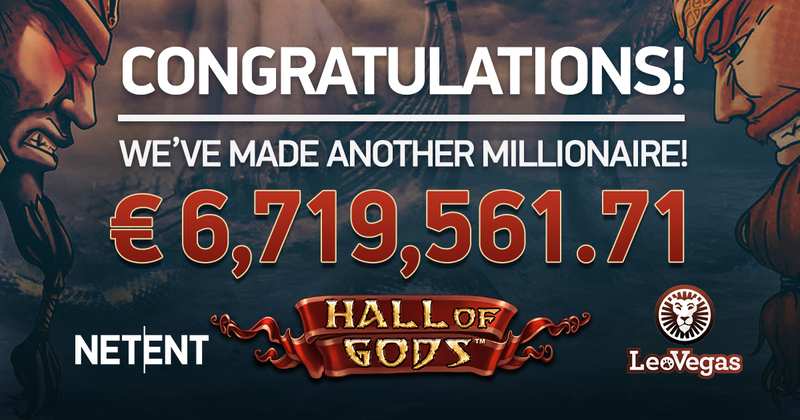 NetEnt, leading provider of digital gaming solutions, has helped create another multi-millionaire after one lucky player collected a massive €6,719,561.71 jackpot win while playing Hall of Gods™ on mobile. NetEnt’s latest jackpot win (which dropped on 2nd April 2018) emphasizes the trend of the increased importance of mobile gaming. The biggest jackpot win of the year so far was won on mobile, highlighting NetEnt’s leading position in mobile slot games. The 37-year-old winner was playing on LeoVegas’ mobile app and staked just €10 before going on to take the seven-figure jackpot. This was the biggest win recorded on Hall of Gods™ mobile so far, and in 2018 alone, NetEnt’s mobile jackpot slots have paid out an astonishing €16,006,657 in total. Henrik Fagerlund, Chief Product Officer of NetEnt, said: “It seems our players can’t stop winning at the moment after another one of our games saw a multi-million euro jackpot drop. “By giving operators access to the largest online jackpots in the iGaming world, NetEnt provide opportunities to promote the dream of a truly life-changing win to their players.